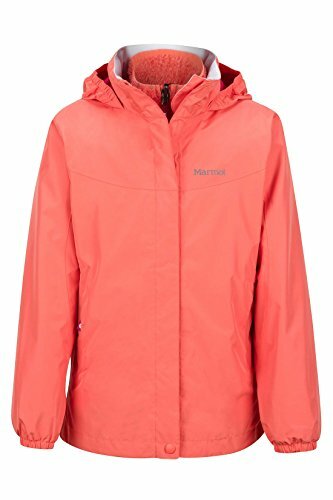 The lightweight, 2-layer Northshore Girls' Hooded Rain Jacket features MemBrain—Marmot's state-of-the-art hydrophilic lamination that repels water and reduces internal condensation. The result is a waterproof and breathable jacket that keeps its wearer comfy and dry in wet weather. To further enhance its cold-busting abilities, the Northshore sports a quick-zip 200-weight fleece liner that can also be removed and worn on its own in milder climates. This design is complemented by fully taped seams to block leaks, an attached hood that can be rolled into the collar when not in use, a DriClime chin guard to prevent chafing, a front zipper protected by double storm flaps with a Velcro and snap closure, zippered hand pockets for storing small items, and Angel-Wing Movement to support full mobility.